In February 2010, a family friend (Steve) was involved in a tragic snowmobile accident leaving him paralyzed from the chest down and confining him to a wheel chair for the rest of his life. Modifications to Steve’s home were necessary if he was to remain in his own home. His family members and friends who had construction backgrounds got together to make the necessary changes. A ramp was installed for access to the home, doorways were widened, and in the bathroom a roll-in shower along with a roll under countertop at the sink was installed. All of these modifications provided Steve with independence; allowing him to complete everyday tasks on his own. 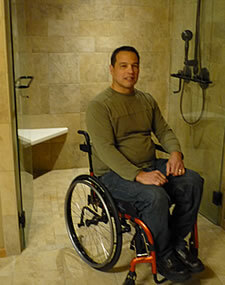 This is when Accessible Bath Solutions LLC was born. It was deeply rewarding to help remove barriers and challenges that emerged around someone in their own home so suddenly. Each individual has a separate set of circumstances and we are dedicated to finding unique solutions to those otherwise seemingly impossible challenges. Our purpose is to express our creativity to find unique solutions to fit our customer needs, and to make everyone we come in contact with feel they can trust us to do the job right.